To overtly stray into the realm of pastiche is never a good thing – examples being Bruce Willis’ venture into rhythm and blues under the laughable pseudonym of Bruno Radolini, UB40’s caucasian mock-reggae or 1970s teddy boy rockers Showaddywaddy (a name I can now only hear in the sinister spectral tones of establishment sweetheart and cadaverous paedo Sir Jimmy Savile). 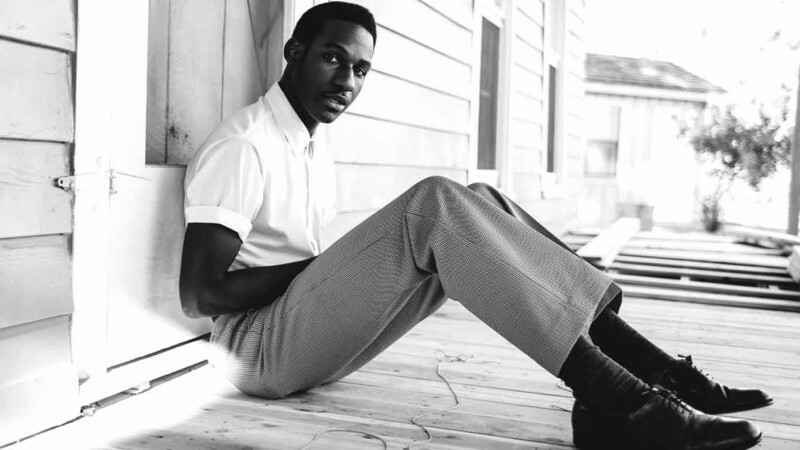 Undoubtedly retro in his style, and having drawn comparisons to classic artists such as Sam Cooke and Otis Redding, Leon Bridges would perhaps be accused of pastiche if his songs weren’t so bloomin’ good. ‘River’ is the third single to be taken from the Texan singer’s enjoyable debut Coming Home, an album that achieved top ten slots in the UK, USA and Australia last year. Though Bridges’ debut contains stronger songs, this sparse acoustic number features some powerful, gospel flavoured backing vocals and provides a subtle arrangement on which he can fully show off his silky smooth vocal talents – it’s a voice smoother than Billy Zane’s noggin after a full Brazilian and a subsequent encounter with a Buff-o-Matic floor waxer. It was once observed that the overall sentience of an audience is inverse to the number of people in it. It’s a theory that holds firm considering that the video for American pop-rock band DNCE’s ‘Cake By The Ocean’ has received in excess of a behemoth 43 million humanoid viewings on YouTube. The song features irksome references to pop culture couplings (“I’ll be Diddy, you’ll be Naomi”), some superfluous effin’ and jeffin and some rather inane lyricism essentially about having a desire to bone a lassie by the sea while chowing down on a lovely bit of Battenberg. At least the video is vaguely entertaining in its airheaded daftness; look out for Bjorn Borg on drums, some 2 Live Crew style flashes of arse and a fella continually saying yes to a panoply of unrealistically attractive ladies on a Tinder-esque dating app – such is the insatiable twinge in his undershorts that even the crushing spectacle of a pouting imbecile isn’t enough to stop him swiping right. It all culminates in a huge cake fight between a host of glamorous ladies and some overweight dude with a haircut so bad that, had he been playing Premiership football in the mid-nineties, pineapple headed Forrest striker Jason Lee would’ve surely been saved from his torment. For this new single from their yet to be announced fourth studio album, the London duo have offered up an aggressive twist on their electro sounds by enlisting the meaty, guitar riffage and hammering drums of Kentonian punk merchants Slaves. The result isn’t bad, it making for a decent enough fusion of heavy punk and the big beat dance of The Fat of the Land era Prodigy – in fact at some points it sounds so similar that if only Slaves singer Laurie Vincent had two pieces of lettuce stuck to the sides of his head, I would swear he was Keith Flint incarnate. Suitably capturing the apocalyptic thrash of the music, the video features burnt out cars, Molotov cocktails, burning tyres (we’re assured that no environment was harmed in the making of this video) and a faceoff between riot police and a gang led by a slightly odd dreadlocked gent who vaguely resembles a cross between Mick Hucknell and a Moomin. Also, listen out for the singer’s Rain Man like obsession with aquatic mammals (“otters are otters are otters are otters are otters”) and a drum kit with so many cymbals that only an especially talented octopus could manage. Tagged chase and status, DNCE, leon bridges, scott hammond, slaves. Bookmark the permalink.